A few years ago Mom & I decided to get some chickens. We live 9 miles from each other. Which meant we would each have our own flock, and we were each other's support group for questions, advice and bragging. 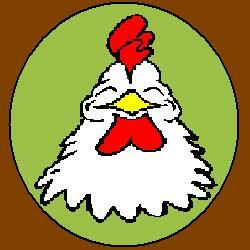 The breed of chicken chosen were Buff Orpington, noted as good egg layers as well as meat birds. We decided to get day-old chicks and raise them to layers. (It's an exciting day when you go to the post office to pick up your box of peeping little chicks.) We brought them home to an area we had ready for them with water and food. We daily cleaned their butts, made sure they were comfortable, had everything they needed, and just enjoyed cuddling with them. Everything was fine except for one thing. We didn't have them vaccinated for Merrick's disease when they were hatched. As the chicks got older, beyond the gawky, all legs stage we noticed some of them were either having a difficult time walking or standing. It was a daily occurrence to find a dead chicken in the coop who had succumbed to the fatal disease. We were losing our chickens, but we discovered something about them that would keep us going with future flocks. Every living thing has a personality. Including chickens. Especially one such chicken by the name of Buddy. Buddy came to live with me after Mom couldn't bear to end his life due to the Merrick's. He actually turned into a learning experience that left memories in it's wake. Buddy couldn't stand, but he could lay around all day. I figured maybe I could get him to use his legs so he would eventually be able to stand again. (Lesson # 1: Chickens do not recover from Merrick's disease. Once they are crippled it's a downhill slide from there). Taking an old t-shirt I cut some holes out for his wings and legs and made a sling. I would put Buddy in this sling and hang him from the backyard tree just so his feet were touching the ground. Oh how he liked that! To be able to see at the same height as other chickens! Buddy enjoyed attention. He liked to be held and talked to. Even though crippled there was still life in him. Well, until he died. He only lived to a little over three months of age, but he left behind the idea that everything has a purpose.